This chapter will describe the basic set of content elements provided by the TYPO3 CMS core. It will show you a description, screenshots of the backend fields and a screenshot of the frontend rendering, only styled with the basic styling provided by the static template "Content Elements CSS (optional) (fluid_styled_content)" described in chapter Using the rendering definitions. The screenshots of the fields are made with the extension configuration option "Show only a minimum set of editing fields" SET TO OFF as described in chapter Configuration. These are fields which are used by (almost) every content element. The type of heading (heading 1, heading 2, heading 3 ... or if the header is hidden). When not choosing an option, the default heading will be used, which can be configured at Constant Editor. Link wrapping the header text. This can be a TYPO3 CMS page, an external page, an email address or a link to a file. The header fields can be found in the "General" tab of a content element. Using this option will only be visible when using menu's based on sections. This will be described in the chapter Special menus. This field can be found in the Appearance tab. The field "Show In Section Menu's"
The field "Append with link to top of page"
When checked, this will render a link below the content element to bring the visitor the top of the page. This will be very convenient for your visitors when having long pages. By checking this option the content element will not be visible to any visitor. The date on which the content has to be published, which means making visible at a certain date. 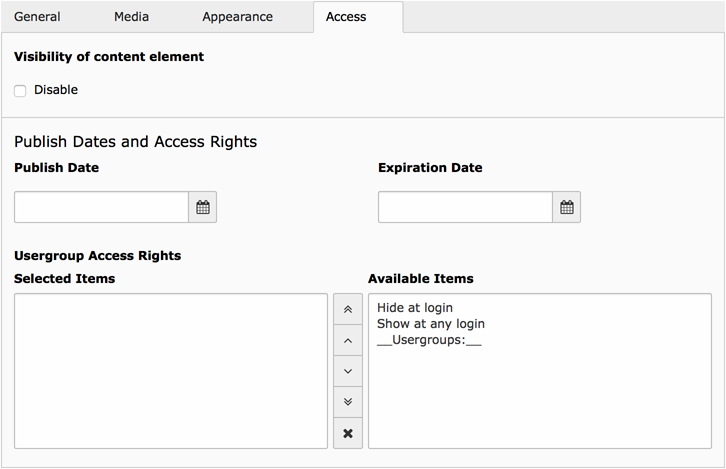 Here you can select whether the content element only is available to a certain frontend user group, if it has to be visible only when the visitor is logged in or if it has to be hidden at a login.